Even as the past century marked the triumph of abstraction in modern art, realism and the representation of the natural and man made world have remained core elements in many artistic projects. But realism as a style remains a moving target. At the furthest remove there is naturalism with its complete fidelity to observed detail. For the past century few artists have aimed so far. We expect artists with a commitment to the real world to do some creative picking and choosing among the plethora of detail the world offers, to aim at a form or realism that involves varying levels of stylization and selection. We recognize the world they present us, but we also know and appreciate that they have made it somehow their own. With an exhibition history that goes back twenty five years, Billy Hassell is an artist who has created such a personalized world. He is engaged and committed to the natural world, having done work for both the Audobon Society and the Nature Conservancy of Texas, but from his earliest paintings he has always been willing to tweak its colors and twist the shapes of its inhabitants. In The Ark (1990) the animals have paired up but they do not seem very orderly. The scene is a carefully constructed mess, with stylized lightning bolts zig-zagging in a bright red sky. While in the middle distance, pairs of fairly realistic bison, zebras, and giraffes prepare to enter the ark, the foreground is filled with gigantic grasshoppers looming over elongated lemurs, and the woodpeckers flying about have bodies that resemble fuselages. A Place Among Thorns (1995) is another image of Hassell’s unpeaceable kingdom. Again there is lightning, and here tiny dirt devils spring from the ground. Bats fill the air and mammals, reptiles, birds, and insects crowd together among the anthropomorphic plant life. The artist has said that one of his earliest encounters with nature was looking under rocks and checking out the life below the surface of his family’s garden. These paintings both honor the unnerving sense of what he found there and begin to bring it under his control. Let’s put them back in their landscapes. Hassell has notebooks filled with plein air drawings and watercolors done on travels through Texas, the Southwest, and north to Canada. 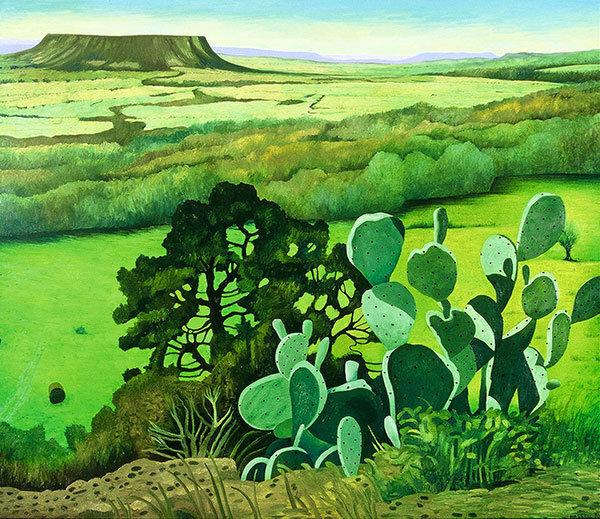 Occasionally one of these will make it almost unchanged into a mesa in the background of what seems to be an improbably green image of the southwest, but the title Overlooking the Brazos (2005) sets the scene in central Texas. So perhaps its springtime before the grass has been baked yellow, the cottonwoods or oaks that fill the river bottom are in full leaf, and even a prickly pear looks bursting with life. It’s a landscape that anyone from this area can appreciate. On the other hand, there is definitely a northern chill to The Portage (1998) based a sketch from Canada. Clouds partially fill what looks like a late afternoon sky, and pine trees cover the shores of the inlet Hassell places us on. The placid water reflects the sky and the tree line, but from the center of the painting to the foreground, the lake water turns an almost acidic green. You can just about justify that green, if you take into account the inverted reflections of the trees on the opposite shore, but eventually the color asserts itself as just what it is – a green not hardly found in nature but that Hassell uses to pull his composition together. It also provides a better backdrop for the single kingfisher perched on a barren limb overarching the water. About that kingfisher. Like most of Hassell’s birds, it is depicted in profile and drawn with careful detail. But if you sense something static about its pose, it could come from the fact that the artist used as his model the kingfisher that appears on the Canadian five dollar bill. Hassell does not put himself forward as an avid birdwatcher. He doesn’t keep a life list, and when he draws in nature it’s the landscape that interests him, not the wildlife – which tends not to sit still. The birds that fill his paintings come from books, natural history museums, and sometimes foreign currency. Nor does he go searching out the exotic. They are the kinds of birds most viewers will be familiar with, garden variety birds that are simultaneously resplendent and ordinary. In his more recent paintings, he tends to place them in a very shallow space. He has referred to this as “Egyptian space,” a reference to the static silhouettes in hieroglyphs. Hassell likes silhouettes. His birds are almost always shown in profile and he strongly delineates their outlines. Wings are raised, beaks are either open or firmly shut in a curved arc, tails create sharp angles against their bodies, and their feet are raised in preparation for a landing. 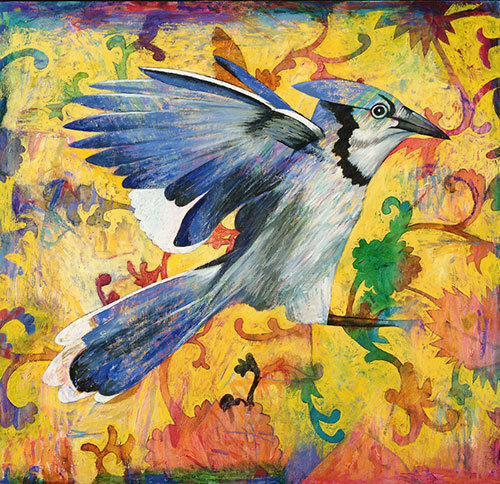 In the lithograph Bluejay Landing (2005) the effect verges on the comical. It’s a fleeting moment we would never really catch in nature, but Hassel has frozen it and presented it here in all its combined awkwardness and elegance. Flight, he reminds us over and over again, is an amazing thing. Although he reports his first encounter with nature was that up close, downward gaze into what was happening beneath the surface of a garden, his painting most often celebrate the delight we feel when things take wing and fly. I understand his reference to Egyptian space, but his single figures against richly detailed backgrounds remind me more of medieval tapestries where each species of plant and animal is clearly delineated for the discerning viewer. Even though I personally tend not to know the names of things, I appreciate the specificity. Sometimes the titles help. Cardinal with Thistles (2007) is not only a spectacular display of red, green, and purple, but the flowers are depicted in varying stages from bud to fully blown. Hassell’s Mockingbird has its eye on a grasshopper that is almost but not quite camouflaged in a patch of Indian Paintbrush, thistles and other yellow wildflowers. Both Hassell’s cardinal and mockingbird are wooden reliefs, cut, painted and mounted onto their supports. It’s a technique that emphasizes their outlines and their iconic presence in the picture. As his backgrounds become reduced to pure pattern rather than natural details, he has experimented with more and more complex relationships between object and ground. In Garden I (2007) the bird’s silhouette is a subtle presence beneath the exuberant and brightly colored pattern that fills the image. It seems overwhelmed by the activity on the surface. The color in Garden II (2007) had been reduced to shades of yellow and ocher, and the wooden relief element interacts with the almost symmetrical image. Upraised wings mirror the leaf shapes, an open-mouthed head is framed by a flower. Such layering of images is absolutely central to Hassell’s project. As he has moved beyond the deep space of landscapes, he presents a rich surface teeming with detail and activated by color and expressive brushing. Silhouettes and wood relief elements disrupt the surface and suggest other layers of information. In The Deception (2003) a woodpecker stares at a beautifully patterned floral surface. A soft change in color and texture along the right side of the painting suggests that it is looking at a curtain, and a globe and what could be the edge of a table places the bird improbably in an interior setting. The title hints that the bird has mistaken the image for nature itself, but he is mesmerized by what he observes. He is clearly a surrogate for ourselves as viewers, placed where the artist wants us to be. We could open the curtain to get a view through the window, but why do that when what is before us offers so much visual delight? Charles Dee Mitchell is a regular contributor to The Dallas Morning News and Art in America. He is based in Dallas, Texas.